Nirinjan Yee, President and Founder of BreathResearch started her company after a series of experiences dating back to 25 years ago. An active outdoor enthusiast, Nirinjan was diagnosed with late stage lime disease. For a couple of years, she became partially paralyzed and her joints were swollen to the point where she couldn’t walk. A blood test showed that she had one of the worst cases of lime disease in Northern California. While being treated with IV antibiotics, unable to move and being told by the medical community that it was too late for her to fully recover, she discovered the art and science of breathing. After practicing for 3-4 hours a day, Nirinjan started to get better, feel less pain and finally was able to fully move again. Now Nirinjan is back to being super active, hiking, dancing and cycling. She wants to show other people that while breathing is very personal and subjective, it is undeniably linked to your physiology and anatomy. She began a 10 year study on respiratory health, using audio to record and study breathing. Nirinjan found the right engineers to work with and they mapped out a way to turn the quiet sound of breathing into data and metrics, turning their work into the downloadable MyBreath app. She is now creating a BreathAcoustics All-in-One Headset that combines her current research and development with a new, more exact breath training headset. I asked Nirinjan a few questions about her newest venture. How does barometric pressure and altitude help form a picture of health? Who do you see using this? Do you have a target audience in mind? When will the first roll out be? While it could be sooner, Nirinjan is focused on making the best product possible. The release is targeted for the end of 2014. What would you like people to know about your vision and the product? PatientPartner is composed of a series of short narrative games that take a user through another person’s life and asks them how that character would handle certain tasks and situations. Then the app asks the user to answer those same questions regarding their own actions. The app takes all these answers and analyzes the users’ selections to give personalized feedback on how the user can improve his/her health. What does Akhila hope for? “We want to get PatientPartner out to millions of people. When we looked at the clinical trial data, we actually thought it would be ethically wrong if we did not release it to the public because we want everyone to have access to it.” PatientPartner gives you two scenarios for free. Then, for the price of a latte, you can unlock additional scenarios and features, including access to a prescription drug coupon (up to 45% off on medications), and earn points redeemable for gift cards and other prizes. BioBeats has merged entertainment and healthcare into their first experimental app, Pulse. Experiment #2 is coming soon – BioMuse. While Pulse is fun – your heart beat drives the rhythm and force of the music, the main goal for BioBeats is to change the sensory settings around you to improve your health and/or entertainment factor. An example would be playing more upbeat music to make you run faster or changing the music to something slower when your heart rate reaches its peak. On the entertainment side, knowing how a person’s biometrics react to a scene in a movie could encourage movie producers to change the music/lighting to engage with the way a person feels. The company is “built on a cloud-based responsive platform designed to support the management of chronic conditions and general wellness,” so I’m sure they are working on clinical and hospital functioning apps as well. Turn Up The Love from BioBeats Inc. on Vimeo. Omada Health is changing the way people reduce their risk of type 2 diabetes. Through their Prevent program, built on research in behavior change and disease prevention, members use personalized coaching, community support and tracking tools to create and continue healthy behaviors. From weight loss to lifestyle changes, Prevent hopes to stop the progression from prediabetes to type 2 diabetes. The Prevent website mentions that “on average, our participants lose 6% of their body weight in just 16 weeks, exceeding clinical results and putting them on the path toward lifelong health.” Additionally, these preventative measures decrease the financial burden of chronic diseases for participants as well as for the overall healthcare system. Omada partners with employers, providers and health plans to deliver the Prevent experience and the company is actively working on other solutions to prevent additional chronic diseases. You can sign up for the Prevent 16-week program online. FitDeck: Digital decks of exercise playing cards that deliver ever-changing workouts for fitness and sports. FitCause: Leverages fitness data as a means of raising money for charities. These companies will present their businesses at two investor Demo Days in June (one at the Nike World Headquarters and one in Silicon Valley) and I look forward to seeing their progress these next three months. With services becoming more on-demand (i.e. telehealth, same-day doctor appointments), it makes sense for there to be an interruption in the massage industry as well. Zeel is a “Massage On Demand” service where you can book a same-day, in-home massage online or through the Zeel app (coming soon). The Zeel Massage Therapist can go to your home, hotel or office and you pay one set price that includes tax and tip. The massage therapist brings their own supplies and table, and you just have to provide the linens, a towel, a pillow and some space. Right now the service is offered in parts of New York City and the company has indicated that it will start to roll out to other places in the United States soon. Today at the Rock Health Demo Day, I watched as 14 bright and eager CEOs presented their start-ups to an audience of supporters, mentors, partners, journalists and potential investors. These 14 companies, now graduating from the Rock Health seed accelerator, are focused on tackling a range of issues, from making pregnancy healthier, safer and less costly (Wildflower Health), to making at-home fitness more accessible, affordable and personal (Wello). Stay tuned for upcoming interviews and deeper dives into many of these businesses, but for now, here are a few photos from tonight. You can learn more about these companies at Rock Health San Francisco 2013 Portfolio. 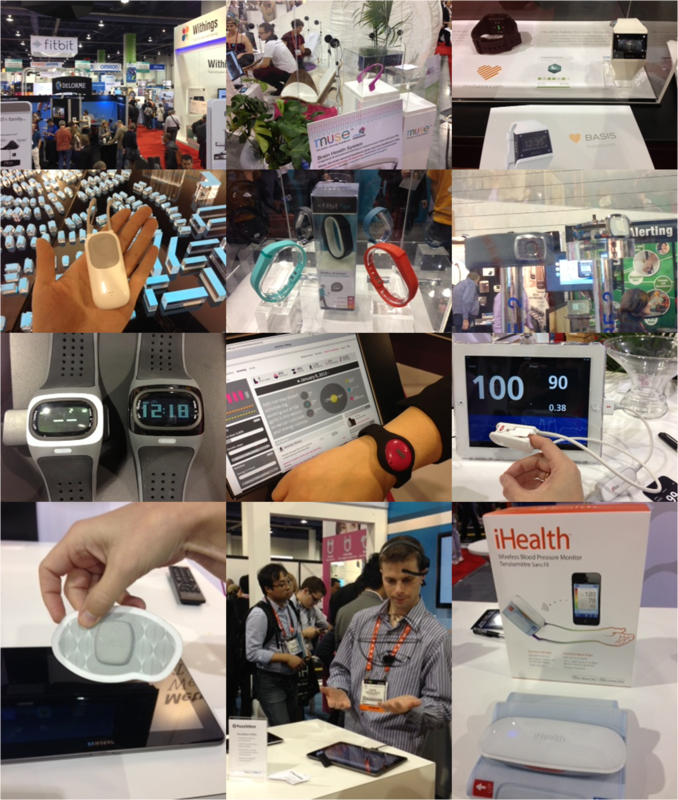 CES 2013 had a greatly expanded health and fitness related consumer device section of the tradeshow. I navigated my way through the massive exhibit floor along with over 150,000 other attendees from around the world. There will be a number of exciting devices of various price points aimed at physical and mental fitness coming to market this year and I will be sure to cover them in more detail as they are released. As for now, here are a few teaser photos from CES.